Why are we holding this inquiry? The purpose of this inquiry is to investigate the ways in which life in immigration detention affects the health, well-being and development of children. The inquiry will assess the impact on children by seeking the views of people who were previously detained as children in closed immigration detention and by assessing the current circumstances and responses of children to immigration detention. Ten years ago the Australian Human Rights Commission released A last resort? the report of the National Inquiry into Children in Immigration Detention (National Inquiry). The National Inquiry found that Australia’s system of mandatory immigration detention of children was fundamentally inconsistent with Australia’s human rights obligations. The National Inquiry also found that children in immigration detention for long periods of time are at high risk of serious mental harm. Since the National Inquiry there have been significant positive developments including the removal of children from high security Immigration Detention Centres, the creation of the Community Detention system and the use of bridging visas for asylum seekers who arrive by boat. Today, however there are approximately 1,000 children in closed immigration detention. This is a higher number than at any point during the period covered by the last inquiry, and the Commission’s monitoring work reveals that key concerns remain. With this increase in child detainees, it is time to look at this issue again. This inquiry will be able to discover what has changed in the ten years since the last investigation, and find out whether Australia is meeting its obligations under the Convention on the Rights of the Child. The benefit of a national inquiry is that it gives a voice to children and families who are directly affected by detention. It also allows professionals, experts and others to have a voice through public hearings and submissions. What are the Terms of Reference for the inquiry? progress that has been made during the 10 years since the Commission’s 2004 report: A last resort? National Inquiry into Children in Immigration Detention. ‘Children’ means any person under the age of 18. Community detention is not part of the scope of this inquiry. The National Children’s Commissioner will provide technical advice to the inquiry on the implementation of the Convention on the Rights of the Child. What is the timeline for the inquiry? This inquiry will be conducted during 2014. The inquiry report, findings and recommendations will be provided to the Australian Government before the end of 2014. Will the inquiry investigate the transfer to and detention of children in Nauru and Manus Island? Inquiry staff will not travel to Nauru or Manus Island, as the powers of the Commission in relation to inquiries cannot be exercised outside of Australia. However, the Commission may make observations on the transfer to and detention of children in Nauru and Manus Island. What is the intended methodology for the inquiry? The inquiry process encourages participation from the public. We are particularly interested in hearing from people who have direct experience of immigration detention, especially people who have experience of detention as children or parents and carers of children. Individuals and organisations can make public or confidential submissions to the inquiry at http://www.humanrights.gov.au/national-inquiry-children-immigration-detention-2014-submissions. Public submissions will be published on the inquiry website. Individuals and organisation can also contribute to the inquiry by attending the inquiry’s public hearings. More information about the hearings will be available at https://www.humanrights.gov.au/national-inquiry-children-immigration-detention-2014. Inquiry staff will conduct a series of visits to immigration detention facilities in Australia where children are held, including the facilities on Christmas Island. The inquiry staff will also conduct research and request relevant information from the Department of Immigration and Border Protection. Information from the submissions, consultations, research and immigration detention visits will be collated into a report containing findings and recommendations. The report will be tabled in Parliament by the Attorney-General. Why are children in detention? Australia’s system of mandatory detention requires that children without a valid visa remain in closed immigration detention until they are granted a visa or removed from Australia, unless the Minister for Immigration and Border Protection decides to make a ‘residence determination’ allowing them to live in community detention. How many children are in detention? By the end of December 2013 there were 1,028 children being held in immigration detention facilities in Australia. This included 460 children in detention on Christmas Island. There were also a further 116 asylum seeker children who had been transferred by the Australian Government into detention on Nauru under the Government’s third country processing regime. 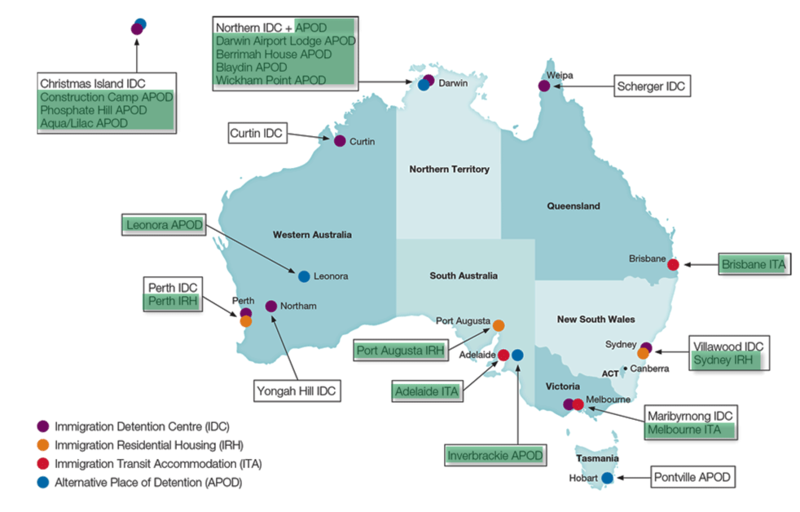 The locations of the immigration detention facilities in which children can be detained in Australia are highlighted in green on the map below. The facilities include Immigration Residential Housing (IRH), Immigration Transit Accommodation (ITA), and Alternative Places of Detention (APODs). Source: Department of Immigration and Citizenship, 13 September 2013. Adapted by the Australian Human Rights Commission. *Pontville APOD has been empty since September 2013, and the Government has announced that it will be closed. Source: Department of Immigration and Border Protection, Immigration Detention and Community Statistics Summary - 31 December 2013, at http://www.immi.gov.au/About/Pages/about-immigration-detention.aspx (viewed 28 January 2014). Convention on the Rights of the Child (CRC), art 2(1). CRC, arts 3(1) and 18(1). CRC, arts 9(1) and 16(1). CRC, arts 28(1) and 31. CRC, arts 22 and 39.